Additional principal casting for this fall’s highly anticipated production of REDEMPTION OF A DOGG, directed by Je’Caryous Johnson, has been confirmed. 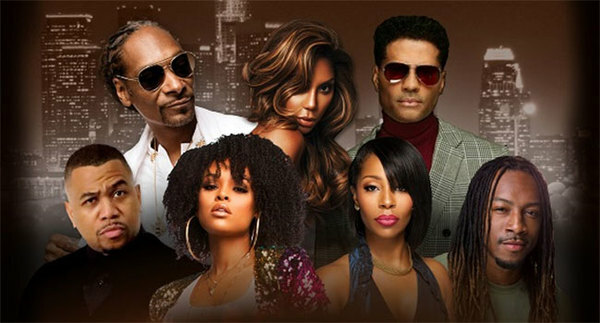 Four-Time Grammy Award Nominee ERIC BENET (Hit songs include “Spend My Life With You,” “You’re The Only One,” “Sometimes I Cry,”) will make his theatrical stage debut and play the role of Terrence, Snoop Dogg’s manager who ultimately starts managing Snoop’s wife in more ways than one. Actress and Singer DEMETRIA MCKINNEY (Tyler Perry’s House of Payne, Saints and Sinners, Superstition) will take the stage in the role of Shani, Snoop Dogg’s wife. Actor OMAR GOODING (Baby Boy, Bounce’s Family Time, Smart Guy and Hangin’ WithMr. Cooper) will appear as Ray Boogie, Snoop Dogg’s DJ and long-time friend and producer. Rounding out the principal cast is actor and comedian JAMES “LIL’ JJ” LEWIS who will take on the iconic role of Young Snoop opposite the previously announced SNOOP DOGG and TAMAR BRAXTON, who will be guiding Snoop along his life’s journey as “The Angel” and serving him up witty what you need to do moments as only her incredibly talented musical presence and personality can do. BRAXTON is the voice of women everywhere who want their man to treat them right and do right. “Audiences will not be ready for what this show is going to give them,” said Johnson. “This will be unlike anything urban theatre audiences have seen. Think of merging some of the best moments of Cirque Du Soleil, Preacher’s Wife, Straight Outta Compton and Back to The Future all into one. It will be one of the most moving, visually stimulating, dramatic and musically charged shows they have seen with some of the most talented, iconic musical stars of our time. They can’t afford to miss this show." Other cast members rounding out the ensemble are actor and comedian Billy Sorrells (MTV’s Wild ‘N Out), actor Vincent Ward (The Starter Wife, The Walking Dead), entertainer and actor Michael Strong (Vivica’s Black Magic), actresses and singers Skye Griffin and LaToya London from the first ever touring Broadway company of “The Color Purple” and American Idol fame. Redemption Of A Dogg is written, directed and produced by award-winning playwright Je’Caryous Johnson and chronicles a character built around the persona of entertainment icon Snoop Dogg -a multi-faceted character who is a gangsta rapper, family man and man of God. Redemption Of A Dogg examines the internal battle one man has between preserving his life-long legacy and losing the love of his life when he is faced with choosing fame and fortune over faith and family. Redemption Of A Dogg is set against a backdrop of Snoop Dogg’s greatest hits, as well as, songs from his recently released chart- topping Gospel album, Bible Of Love. The show will also include musical favorites and numbers from Tamar Braxton and Eric Benet, as well as original numbers penned from the hands of Johnson and the production’s musical director, Donnie “D-MAJOR” Boynton. To date, Je’Caryous Johnson has toured over 21 stage play productions to sold-out crowds and written over 37 plays. Johnson’s most recent touring stage play was Set It Off. The play was based on the critically acclaimed cult classic film by the same name and starred hip hop legend DaBrat. Johnson’s latest entertainment venture with Snoop Dogg through Redemption of a Dogg, allows him to continue to break the glass ceiling on what urban theatre audiences have become accustomed to and set a higher standard on both the production and entertainment value of urban theatre shows presented to audiences. In addition to the high energy, emotionally captivating musical numbers, the show will also have some high flying stunts, action sequences and surprise reveals that will leave audiences on the edge of their seats. There will also be SPECIAL GUESTS and VIP FRIENDS that will appear in cities across the tour. “Tamar‘s portrayal of ‘The Angel’ in this production is simply brilliant!” said Eric Benet. “I don’t think the stage has ever seen an Angel with so much personality, realness and life. Tamar is truly a joy to work with! The only thing that surpasses Snoop’s icon status is his professionalism and his talent. Snoop really makes the whole cast raise their game. I’m truly blessed to be a part of this incredible production that has been masterfully crafted and directed by Je’Caryous... with such meaningful messages of life redemption and the power of faith."